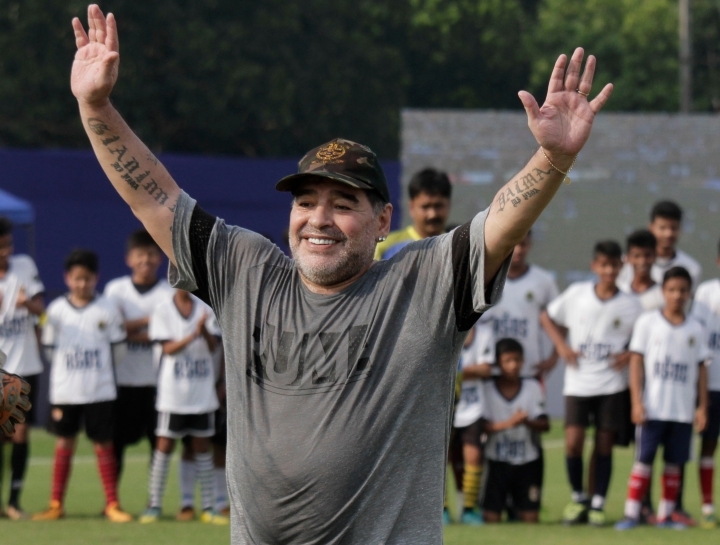 DUBAI, United Arab Emirates — Diego Maradona has left his coaching job in the United Arab Emirates after his team failed to win automatic promotion to the top division. The former Argentina World Cup winner was managing UAE first division club Al Fujairah, which was bidding for a place in the Arabian Gulf League, the UAE's top flight. A 1-1 draw with Khorfakkan on Friday meant that Al Fujairah could not finish any higher than third place, missing out on automatic promotion but still with a chance of going up via a two-leg playoff. After the game, Maradona's lawyer Matias Morla confirmed he was leaving the club. "After today's draw and not having achieved the goal of ascending (promotion) to Fujairah, Diego Maradona will no longer be the team coach," Morla tweeted in Spanish. He added that "the decision was made in common agreement," with Maradona "wishing the best to the club that opened its doors." Soccer great Maradona, 57, joined Al Fujairah in 2017 on a one-year contract, which included an extension clause if the team won promotion.